Get email alerts for CVS Coupons! Until Jan 2nd and online only, CVS offers 20% Off Regular Priced Items Sitewide & Free 2-Day Shipping (no minimum) with coupon code SAVE20 at checkout. 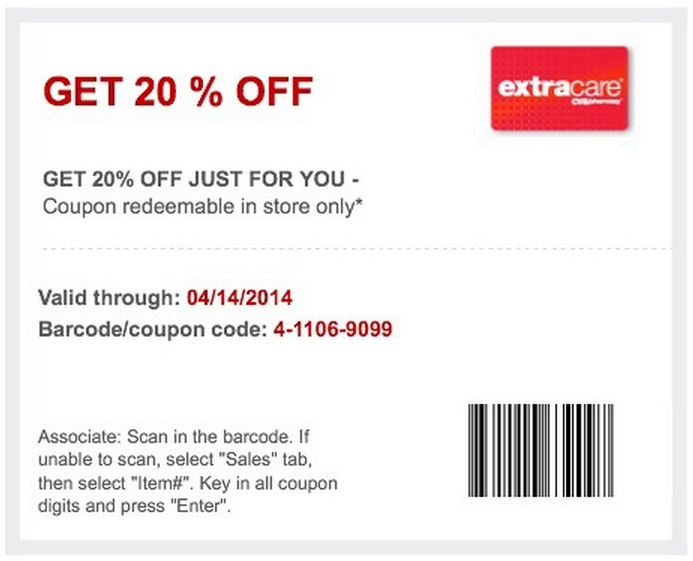 In store only, CVS offers 20% off site wide with printable coupon. Promotion ends April 14, 2014 at 11:59 PM ET. CVS is offering 30% off your entire purchase with coupon code 30OFF at checkout. Stack coupon code 15DEAL to save $15 off $60 or more. CVS is offering 30% off your entire purchase with coupon code 30OFF at checkout. Stack coupon code 15DEAL to save $15 off $60 or more. #CVS offers 25% off site wide with coupon code GET25 at checkout. Promotion ends June 10 2013 at 11:59 PM ET.